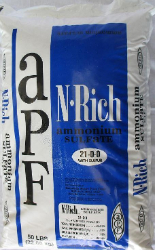 White, free flowing granular (N-Rich™) non-leaching ammoniacal nitrogen 21% chemically compounded with sulfate sulfur 24%. A new crystallizer system refines high-quality ammonium sulfate. This new crystallizer has increased production of larger SGN particles and is setting the standard for efficiency. Ammonium sulfate is ideal for blending or direct application. Coarse, standard, compacted and feed grades are also available. Ammonium sulfate is the preferred nitrogen source for rice, wheat and pastures in sulfur deficient areas and in alkaline row crop areas.